Noida: We are lucky to have H.E. 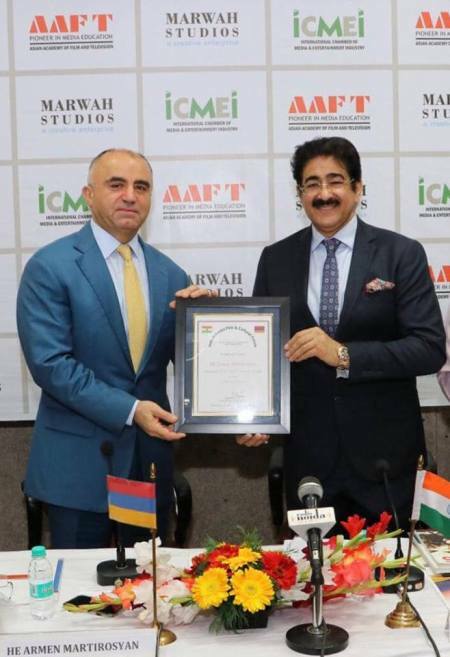 Armen Martisosyan Ambassador of Armenia as the first patron to newly formed Indo Armenian Cultural Forum which has been constituted to develop and promote relation between two countries through art and culture,” said Dr. Sandeep Marwah President of International Chamber of Media And Entertainment Industry while presenting the certificate of Patronship to the Ambassador in a well designed event at Noida Film City. “It is my privilege to be associated with this organization, which has been formed to promote and develop best relation between the people of two countries. We can do a lot when it comes to art and culture,” said H.E. Armen Martirosyan Ambassador of Armenia to India. Earlier Armen Martirosyan was advisor to Foreign Minister, Ambassador of Armenia to Germany. He was permanent representative of Armenia to the United Nations. He was also the Deputy Minister of Foreign Affairs of his country. As Member Parliament he was member of Finance and Budget Committee. He was also the Chief Executive of Armeco Bank. He was nominated advisor to Prime Minister of Armenia.